Starting with my favourite fragrance of 2017, yes I'm holding my hand up and saying this was my favourite. Gucci Bloom. The first of the Gucci perfume family that I instantly fell in love with and had to have it straight away. Something about the simplistic packaging of the bottle has me doing heart eyes every time I look at it. The outer box packaging is slight more eye popping but equally as gorgeous (but it's not pink so couldn't show the box because we're on a theme here). This fragrance was made with the idea of when someone smells it they want to transport you to the most gorgeous magical garden and while I'm not that great at being 'transported' to places by scents it definitely does smell magical. Heres the part where I would google the main scents of this fragrance (and I did) but to be honest I can't pronounce half of the things included so I'm going to describe it myself and say long story short it's a very sweet, floral and girly fragrance. Mon Guerlain is a fragrance I never took notice of, not going to lie I think it took me till Summer of last year to realise it even existed but damn was I missing out! While Guerlain isn't really a brand I would ever think of for fragrances I am so glad I came across this little gem. Firstly can we talk about that packaging!? Is that not the most prettiest girliest design you ever did see? I swear this perfume bottle features in 90% of my Instagram/Blog photos just because it is so pretty. The name is very neatly engraved at the bottom of the bottle and I just think it's such a classical looking design. Guerlain designed this fragrance as a tribute to todays femininity. (Look at me using my fragrance training in blog posts, who am I) The fragrance itself is very fresh and oriental, I do think it's a scent that you will either love or hate it. It is very different than the scents I normally go for but something about it is just so lovely and it lasts for hours on the skin. Ari by Ariana Grande while a lot of people turn their noses up to celebrity fragrances, if my fave celebs release a fragrance I'll buy it if I like it. I have no problem wearing celebrity fragrances because the ones I own are actually really nice and sweet. I had to include Ariana's debut fragrance because still to this day it is one of my favourites. Starting with the bottle design, I mean just look at it, is it not the coolest thing ever?! I'm obsessed! The rose gold cap and massive white pom pom adds that extra touch of girlyness and in my opinion instagram-worthiness to it. Again it's a very sweet scent (can you tell what my go to fragrances are?). Something I will admit to when it comes to celebrity fragrances is they don't last as long as the big name perfumes, of course a bottle of this up against Chanel is not going to be much of a competition but saying that I still have no problem with it. I definitely think celebrity perfumes are the perfect ones to start out with or if you're like me just collect them because your favourite singer releases them, either way you do you! Jean Paul Gaultier is probably one of the biggest name brands when it comes to fragrances yet I never fell in love with any of the scents they released, well that is until Scandal came along. Moving away from their iconic bust figure bottles and introducing the new leg design to look a little bit more scandalous. Designed for the classic lady by day and party animal by night, again look who's using her training *flips hair*. This is a totally different direction for me when it comes to fragrance scents I normally wear. This is quite a strong and bold fragrance definitely one that screams night time fragrance to me but I still wear it during the day but I definitely see what they were trying to do when making this fragrance. With a lot of Honey in the ingredients while it has a hint of sweetness it is definitely a strong vibrant kind of fragrance. I do absolutely love the new bottle design, while the legs only feature on the lid of the 50ml and up they didn't want to totally get rid of them from the 30ml so they added them on as a charm which I think is the cutest little touch. Finally the newest perfume added to my collection Dior Miss Dior. A fragrance good enough for a Princess, or Blair Waldorf..so a Princess basically. 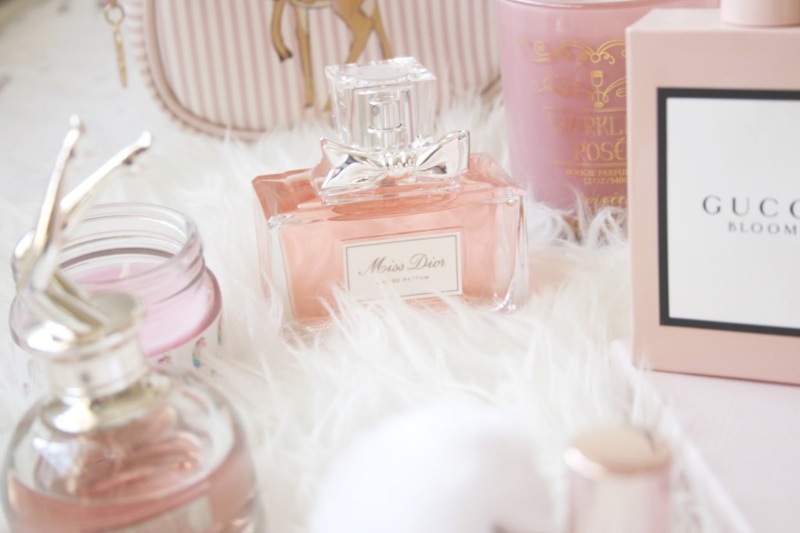 I mean you can't not look at that bottle and think 'C'mon Grandma hurry up and tell me I'm the Princess of Genovia already.." No but really out of them all I definitely think this is my favourite bottle design, it's just so dreamy and pretty I love it. This is another floral fragrance but I'm also going to describe it as almost like a powdery rose..if thats even a description. This is the one that if somebody said they wanted to splurge and buy a really nice perfume I'd be bringing them right up to this one, again I've yet to meet someone that smells it and doesn't like it. While I wasn't a fan of the J'adore scents this I definitely find is an any age perfume, and as it is Dior you're guaranteed that it lasts for hours upon hours. If I spray this on myself or my clothes I can still smell it the next day thats how well it lasts. And there you have it, my favourite pretty pink perfumes currently in my collection. If you have yet to smell any of these yet I highly recommend you to skip to your local fragrance shop and give them all a sniff. 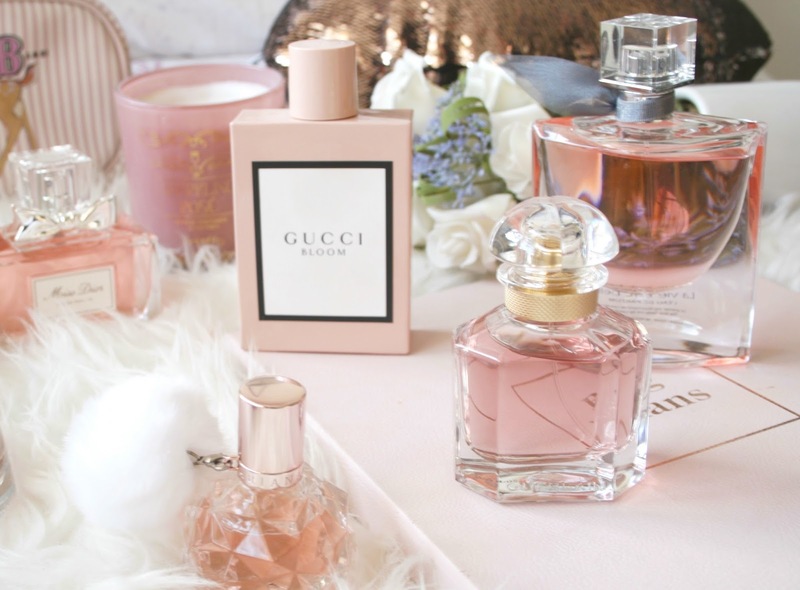 I love a good fragrance post. And I totally agree with the celebrity perfume thing, some of them are actually quite nice. I have the Ariana Grande Sweet Like Candy and also the Taylor Swift Wonderstruck Enchanted. I don't necessarily choose base of which celebrity I like the best but these scents were gorgeous! 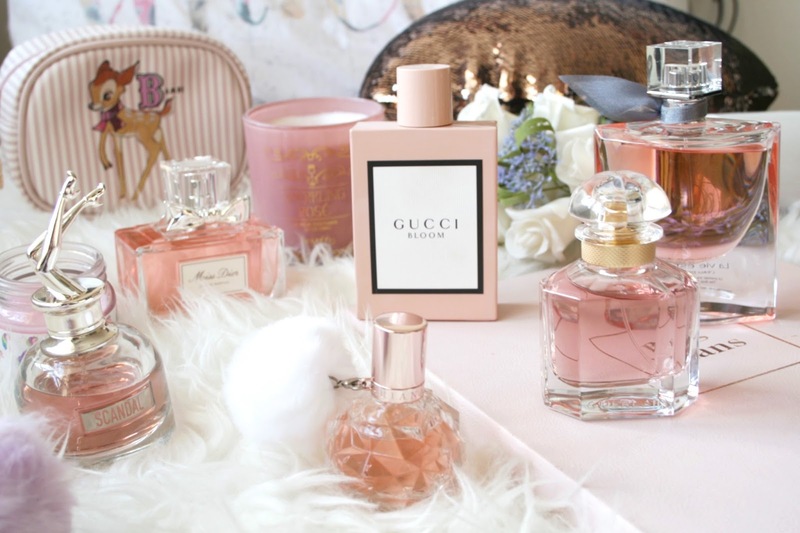 i would love to get gucci bloom. not only is the packaging just beautiful, it also smells so good. 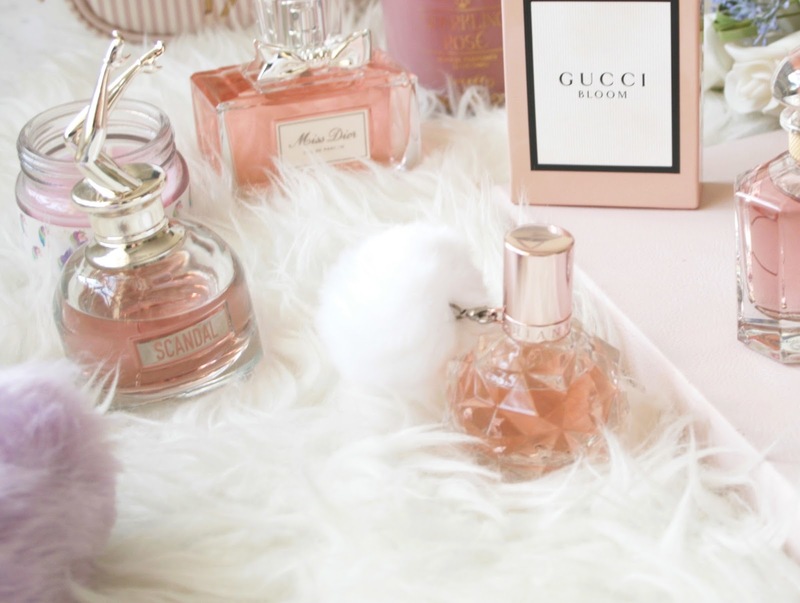 All these perfumes look so gorgeous!